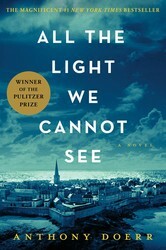 The book follows the lives of a blind French girl named Marie-Laure and a gifted German boy named Werner who has a special talent for radio technology. Their stories run parallel and eventually converge. Doerr devoted ten years to writing the book and wrote two others during that time. Doerr’s extensive research is notable. The book is sentimental, and in a good way. This is a lyrical and intricate book with a highly readable format. I’ll be interested in whatever he publishes next.